An open sourced Visual Studio extension to add a project context menu for editing project file. 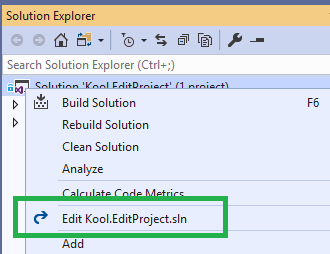 Edit Project is an open sourced Visual Studio extension to add the context menu for editing project/solution file. Add Edit Solution File menu. Add Edit Project File menu for non .NETCore projects. Add Edit Selected Projects menu for multiple selected projects. 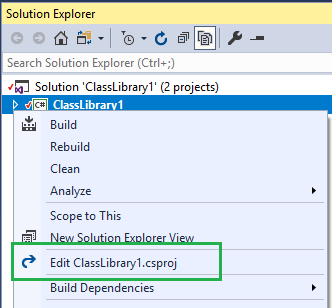 Because the Edit Selected Projects menu works for all kinds of projects, include .NETCore projects which have the VS built-in Edit Project menu. 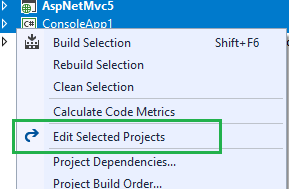 If you open a .NETCore project via this menu then open it via the VS built-in menu (or reverse), two edit windows will be opened. If you have any question or problem, feel free to open an issue on GitHub.